ManiPedi is a specialist Nail Bar and Foot Spa in Cape Town that has built its foundation on the passion they have for nails. They aim to provide their customers with the best quality nails in the country coupled with the highest possible hygiene standards. They are also trying to break the traditional nail and beauty salon mould to encourage and promote interaction with therapists, as well as each other. They pride themselves on providing a superior quality service in a unique, youthful and energetic environment. 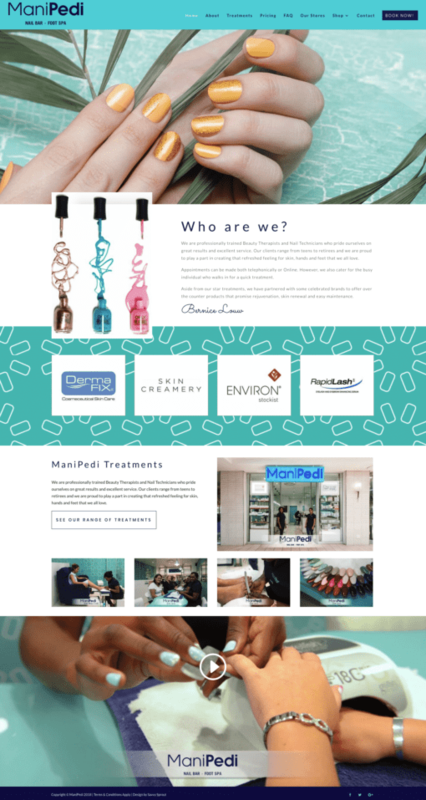 ManiPedi had a brand vision, but their branding elements such as their website, imagery and designs were not complimentary to that vision. Their first goal was to create a website and online brand that resonated with their target audience and created a pleasurable experience. “Our previous website was outdated and poorly designed. Our online presence did not reflect our brand, nor did it complement our brick and mortar identity,” Bernice Louw, owner of ManiPedi. Some of the key elements ManiPedi wanted to see included, among others, a colourful, modern, extremely user-friendly, mobile and recognisable design that was as an extension of their brand and promoted interaction to ultimately increase store visits and sales. Due to some extremely negative experiences in the past, they were looking for a digital partner that was able to take the lead and guide them as the project progressed. Due to time constraints with another store opening, we were able to deliver a final product within 1 month from initial discussion to go-live. “We are very satisfied with the outcome and our new website looks great! It reflects our brand perfectly, it’s easy to navigate and fulfils all our requirements and more,” continues Louw. The ManiPedi team were incredibly satisfied with the results and we knew that after their previous negative experiences that we had to change their perception for the industry as a whole, not just for ourselves. We would happily refer Savvy Sprout and the services they offer to others. After a very bad experience with another supplier, working with Savvy Sprout has been very positive experience for us. We have already engaged them to manage our social media platforms as well and look forward to seeing more positive outcomes in the future.